AND NOTHING ELSE. Now that you've got that mental image, here's the money quote. 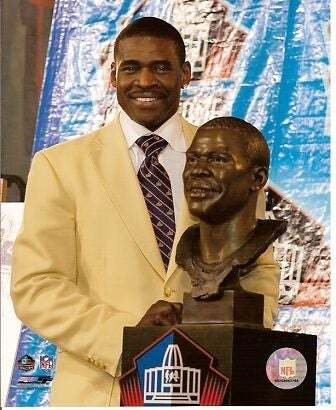 I remember when I was inducted into the Hall of Fame and they gave me my Hall of Fame yellow blazer. I wore it for two straight days. Finally my wife was in bed and said she wanted to make love but that I had to take the coat off. I refused and kept the blazer on because I wanted to perform like a Hall of Famer on the field and off." Marking the first time anything that yellow has gotten laid since Lewis and Gilbert in Revenge of the Nerds. Oh, and keep in mind that Irvin was inducted into the HOF about a month after being accused of sexual assault at a Florida hotel. So it's not like his libido was suffering for a lack of the jacket.